Volunteers Needed... It's that time of year again, when nesting season for the rare and endangered kukuluāe‘o (Hawaiian Stilts) is about to begin. 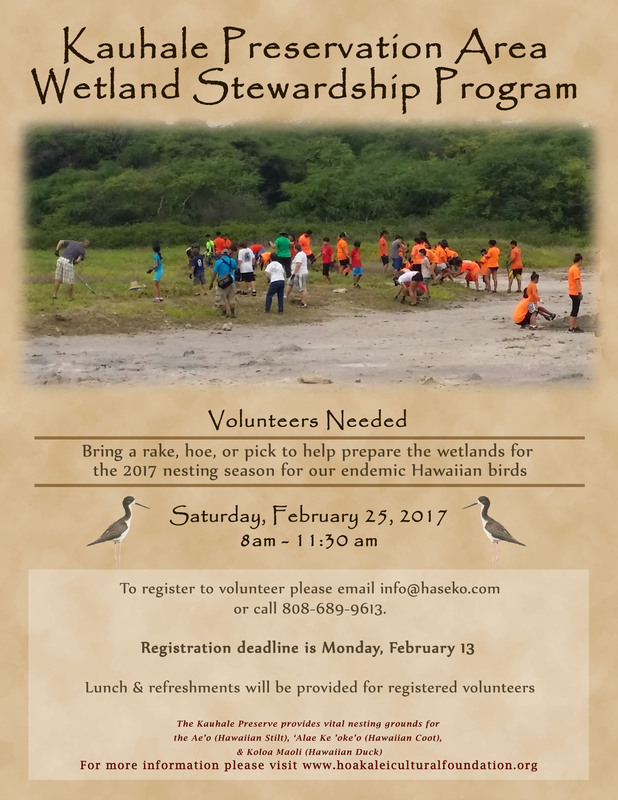 For 10 years, the Hoakalei Cutural Foundation and friends have engaged in preparing the wetland in the Kauhale Preserve for the nesting season of the kukuluāe‘o. The introduced pickle weed, covers the nesting ground and traps the young hatchlings, leading to a high mortality rate. Over the years, the hard work of more than 1,000 volunteers has helped to make the annual nesting season a success. The kukuluāe‘o, ‘alae ke‘oke‘o and other native water birds make the wetland their home. Please help these rare species increase their population by caring for the land. To register to volunteer, please email info@haseko.com or call 808.689.9613. Please bring a rake, hoe, or pick to help prepare the wetlands for the 2017 nesting season. Plan to have fun, work hard with many other friends, and enjoy some food and talk story... Mahalo... 'A‘ohe hana nui ke alu 'ia (It's no big task when done together by all)!